Having moved to Norfolk from Herts with her family at the age of 12, Tracy attended Wymondham High and then Wymondham College, before moving to Essex to do an equine studies degree at Writtle College, which later became a masters. Following this, Tracy spent 10 years as a lecturer and instructor at the college before her curiosity towards equine behaviour led her along a new path and right back to where it all began – Norfolk. ……. Tracy currently teaches foundation degree students at Otley College, judges dressage at a local riding club and teaches at Pony Club, while having her own clients who she teaches on a freelance basis. She is also an examiner for horse management courses for NPTC (City & Guilds), an NVQ assessor, a speaker at educational talks ranging from local clubs to the BVNA (British Veterinary Nurses Association) conference and teacher of bespoke courses for para-professionals such as equine sports massage workers. As Lingfield tutor, Tracy will share a personal online cloud folder with each student to enable her to check assignments securely and privately. Common problems that Tracy tackles include: bucking, napping, rearing, bolting, and spooking and further up the levels problems with a particular dressage movement or type of jump – usually after a loss of confidence. Problems with loading and clipping are also fairly common. “It’s important to remember with problems such as clipping and loading that there is no ‘magic cure’, so where these problems occur it’s important to spend lots of time in advance dealing with them as some fear-related behaviours can take multiple sessions to resolve,” says Tracy. Owners can be quick to reprimand horses for bad behaviour, without fully understanding the cause. Tracy’s extensive training and many years in the field have helped her to educate her pupils. “Every problem has a cause; but the cause can vary considerably,” says Tracy. “Causes usually fall into one of two categories, pain or learnt misbehaviour due to the horse believing that they are ‘in charge’ of the rider or handler. Sometimes the problem is easy to solve simply by changing the diet or management, but other problems can be multi-factorial and lots of things need to be addressed. “It’s important to remember that horses don’t think in the same way as us – they don’t get out of bed in the morning and think ‘I know I’m going to be really naughty today!’ Although domesticated, horses are still governed by their ‘flight or fight’ instincts and are very social which can lead to problems. Behaviour consultants’ training focuses on using correct identification and interpretation of the horse’s body language to understand why the horse is behaving as he is, along with the science of learning theory to devise suitable re-training programmes. “This allows us to get to the root of the problem much more quickly, therefore making the process safer for the rider, while improving the horse’s welfare. A horse in pain can quickly turn into a dangerous one if the rider resorts to increasingly stronger methods to ‘fix’ the problem such as severe bits or spurs. Similarly a horse that is pain-free, showing a confident learnt behaviour can quickly become more difficult if the rider is not firm.” A full case history is something that Tracy insists on with new clients before she will touch the horse. The case history ensures that any physical problems, such as poorly fitting tack or lameness, are dealt with prior to her training, leaving Tracy to deal only with the issue at hand. “Sometimes a simple change of diet or management can solve the problem in a short space of time. More complicated problems can take months of careful re-training and the involvement of several professionals such as a farrier, physiotherapist or saddler to resolve,” she says. EBCs use three main re-training techniques – all are based on scientific theory: Systematic de-sensitisation, counter conditioning and shaping. Whilst sending a horse away to be trained can help in some cases, often the problem is person or place specific – so the problem re-occurs when the horse is back with the owner. “I work with the owner – through lessons or training sessions and by devising a training plan that they have to carry out,” says Tracy. Claire has a three-year-old Spanish mare who was virtually unhandled when she bought her. She was very difficult to handle even with simple things such as being led. Silver was also very socially dominant. I advised Claire to turn Silver out with an older, more dominant mare who politely ‘put Silver in her place’ (as would happen in the wild). We also made some husbandry changes to ensure that when Claire was working around her she was always re-enforcing that she was in charge. We have also been working Silver from the ground, using systematic desensitisation, counter conditioning and shaping, setting clear boundaries and gradual goals. She is now lunging calmly and confidently in tack and long reining over poles and we are about to start backing her. Tracy currently teaches foundation degree students at Otley College, judges dressage at a local riding club and teaches at Pony Club, plus has her own clients whom she teaches on a freelance basis. 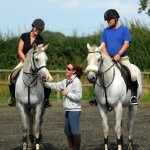 She is also an examiner for horse management courses for NPTC (City & Guilds), an NVQ assessor, a speaker at educational talks ranging from local clubs to the BVNA (British Veterinary Nurses Association) conference and teacher of bespoke courses for para-professionals such as equine sports massage workers. Tracy is currently freelance, but is hoping to have a permanent training base to be able to offer further services, such as running short courses on behaviour and other horse-related subjects, as well as having guest speakers; and to be able to offer intensive help for those that need it.